Professor Hrymak is Western’s Provost & Vice-President (Academic) for the term August 1, 2018 to July 31, 2023. Prior to this role, he served as Dean of Western Engineering after being recruited from McMaster University in 2009. At McMaster, he was a professor and chair of the Department of Chemical Engineering, as well as director of the Walter G. Booth School of Engineering Practice and McMaster Manufacturing Research Institute. As Provost & Vice-President (Academic), professor Hrymak is Western’s chief academic and budgetary officer, providing senior executive oversight for a broad portfolio of academic and administrative units across campus, including 12 Faculties/Schools, Student Experience, Faculty Relations, Western International, Libraries, Registrar's Office, Institutional Planning & Budgeting, Technology Services, and the McIntosh Gallery. 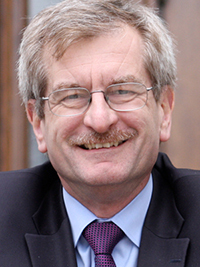 He also serves as Deputy Director of the Fraunhofer Project Centre for Composites Research @ Western. For a more complete picture of the Provost’s portfolio, please see the organizational chart at http://provost.uwo.ca/provost/org_chart.html. While Dean of Engineering, professor Hrymak led a significant expansion of undergraduate and graduate student enrolment, oversaw construction of the new engineering building and world-first WindEEE Dome, and fostered a collaborative, interdisciplinary teaching and research culture through multiple partnerships with other Faculties and Schools across campus. He also played a leadership role in securing a long-term partnership between Western and the Fraunhofer Institute of Chemical Technology in the area of composites research, representing the first-ever comprehensive joint venture between a Canadian university and an institute of Fraunhofer-Gessellschaft—Europe’s largest application-oriented research organization. Professor Hrymak holds a BEng degree from McMaster University and a PhD from Carnegie Mellon University. His research interests include modeling, design and optimization of materials processing systems, in particular: composites processing, injection molding, compression molding, mixing liquid coating flows, and complex rheology. He is a Fellow of both the Canadian Academy of Engineering and the Chemical Institute of Canada.